PSA Insider - See the "Black Swamp Find" Cards This Week in Long Beach! Parkhurst hockey sets from the 1950s all seem to be on fire as of late. These sets are what Topps was, and is, to baseball during the same period. This 105-card issue, which closely resembles the 1951 Parkhurst design, is colorful and difficult just like its predecessor. The three keys to the set are the #1 Maurice Richard, #58 Tim Horton rookie and the 2nd-year Gordie Howe card. With a GPA of 7.75, this year's winner is the finest complete set in registry history and, shockingly, the only complete set in any grade on the Current Finest list. Click here to view. Want List & Collectors Corner If you are using the Want List feature in My Set Registry, you'll find an enhancement which we rolled out last week. From the items in your want list there are now links to items which are available in Collectors Corner. Collectors Corner, a division of the Certified Coin Exchange, is one of the Collectors Universe (NASDAQ:CLCT) divisions along with PSA and PSA/DNA. Today, Collectors Corner is listing over 21,000 sports and non-sports cards and tickets by qualified dealers. We hope you'll find this new feature a useful way to fill your want lists. 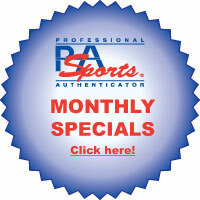 All Sports and Non-Sports - $8 Per Card/10-card minimum - cards valued under $100 each. Click here for details. Excitement around the upcoming fall auction is growing. We invite you to register to receive a free full color catalog for our upcoming Fall 2012 Premier Auction of Sports Memorabilia and Collectibles (www.goldinauctions.com) opening October 10, 2012. The auction will feature over 1,000 lots of the finest Sports Memorabilia and Collectibles in the industry. Click here to read more! Some of the century-old rare, series E98 baseball cards that recently generated national headlines - the treasure trove of 1910-era cards discovered in an Ohio house attic - will be publicly exhibited for the first time on the West Coast at the Long Beach Coin, Stamp & Collectibles Expo (www.LongBeachExpo.com). The show is open to the public in the Long Beach, California Convention Center, 100 S. Pine Ave., September 6 - 8, 2012. Click here to read more! There are 630 lots for auction that will end on Thursday September 6, 2012, at 11 PM EST using the 15 minute rule. This auction features many high grade and low pop cards for collectors to complete their sets from the 1950s through the 1970s. There are some nice groups of 1960 Topps baseball, 1963 Topps Baseball all graded, 1964 Topps Stand Up Baseball & Coins, 1966 Topps Baseball, a nearly complete 1959 Topps Football set only missing the Unitas all graded PSA 8, and some 1962 Salada Football coins all graded PSA 8 or better, plus much more. Click here for more! Company Accepting Consignments for Inaugural Auction in October. Love of the Game Auctions, a new Internet-based sports auction house catering to the passionate collector of memorabilia and cards, has launched operations and is inviting collectors to register to bid in its upcoming auctions. Click here for more! Which of the following quarterbacks will enjoy the biggest boost in the hobby this year?